I just wanted to update you all on my health status, per the Chinese medical exam. As you recall, there was some controversy about whether or not my spine had been removed during my surgery last winter. I am relieved to tell you that it was NOT removed, according to my medical report. 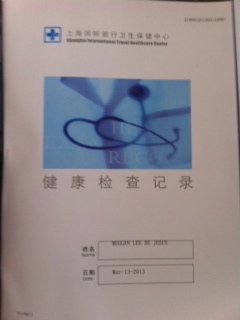 (I just received it – the last step in establishing residency here in China.) Instead, through some miracle, they removed my spleen. Without my knowing. I was honestly a bit anxious about the results of that very invasive examination process. Somehow I feel better now. Spleen-less, but better. You are anything but spineless.